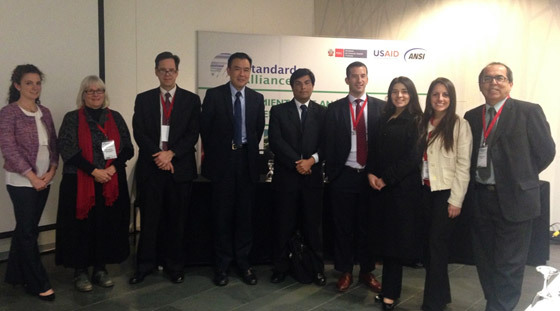 The Standards Alliance co-hosted a workshop with the Peruvian Ministry of Foreign Commerce and Tourism (MINCETUR) from October 29-30, 2014 in Lima, Peru. The 2-day event focused on analytical tools for regulatory decision-making and regulatory impact assessment (RIA). Over 70 representatives of Peruvian regulatory agencies attended the workshop, including the Ministry of Economy and Finance (MEF), the Ministry of Production (PRODUCE) and the Ministry of Health – General Direction of Environmental Health (DIGESA). The U.S. delegation comprised representatives from ANSI, the U.S. Trade Representative (USTR), the Office of Management and Budget (OMB) – Office of Information and Regulatory Affairs (OIRA), the U.S. Department of Agriculture (USDA), and the U.S. Environmental Protection Agency (EPA).